Liquitex Pouring Medium can be used in combination with Liquitex Soft Body Acrylic Colours to create seamless surfaces and puddles of colour. Liquitex Pouring Medium is formulated to create a smooth, seamless, and strong body of paint when poured or dripped onto a surface. Suspend Liquitex Acrylic Colours in Liquitex Pouring Medium for sculptural effects and surface treatments. Mix one tablespoon or more of Liquitex Soft Body Acrylic Colour with one cup of Liquitex Pouring Medium in a large bucket or bowl. It helps to mix custom colours before adding to the medium, to ensure a uniformity of colour in the pour. Mix the colour and the pouring medium by hand with a palette knife. In order to prevent bubbles, blend gently and allow the mixture to sit for 10 minutes following agitation. Using a funnel, take the mixture and pour it into a squeeze bottle or applicator of choice. Additional applicators such as pitchers or tubes can be used for a variety of effects. The paint is now ready to be poured. 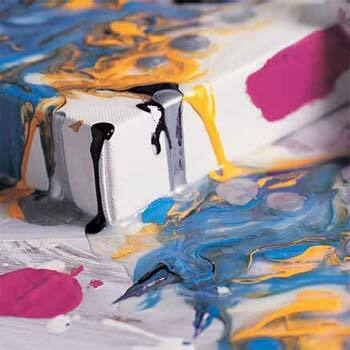 Mixture can be poured directly on canvas or board supports, glass, or even paper. A good place to work with poured media is on a level work table. If the surface is not level, you may produce uneven results with very thin pieces that may tear. Pour evenly over the surface and allow at least one day of dry time. If the paint film is thicker allow up to two days of dry time. Paint wet in wet! Multicoloured compositions can be created in one sitting if several colours are prepared at a time. Apply the next colour directly after the first pour for spots or crisp concentric circles. Marbled surfaces can be created using multiple colours applied side by side and then blended using a palette knife or by dragging a fork or pointed tool through the surface. Turn the support on its side to create thin drips. Allow the paint to run down the support surface at a variety of speeds. Pours and pools can be layered. Apply another coat after the first has dried for layers of colour. For sculptural applications, directly pour medium and paint mixture onto a glass surface to create a moveable, flexible paint slick. To make removable pours, treat the glass surface with a mold release or quick release spray for easy removal of the paint after it dries. When dry the poured paint can be sewn, glued, or rolled for different sculptural effects. In order to ensure the continued strength of the paint film, do not mix water with the Liquitex Pouring Medium. Dust can get caught in the paint film if left open to the air. Cover the painted canvas, glass, or board with a larger cardboard box to ensure a clean pour.